Azure Naturals is a skincare company that provides high-quality facial skincare and anti-aging products using natural and organic ingredients whenever possible. Their Ultimate Retinol Lime-Infused Organic Moisturizer contains 2.5% Retinol (Vitamin A), Hyaluronic Acid, Aloe, Vitamin E, and Green Tea plus Lime and Lavender Oil. This moisturizer is designed to be gentle even with the high strength of Retinol it contains, so that it can be used around eyes and on sensitive skin. I personally haven't used it around my eyes yet as I'm still working my way up to using Retinol regularly with my sensitive skin. I find that my skin gets irritated or flaky when I use Retinol products too much at once. So using this moisturizer on my face just at night or every other night is what works best for me. It is recommended to work your way up if you haven't used Retinol before, so eventually I would like to use it more. The moisturizer has a very light citrusy-lavender scent but is much less "lime-y" than I expected - which is a good thing! It's very subtle and a nice scent. The cream itself absorbs quickly and leaves my skin feeling hydrated and smooth. It doesn't leave any greasy residue or leave me with redness or irritation. I was impressed with how gentle it is and how good my skin felt after using it. I do think it is helping reduce and eliminate my occasional blemishes, as well as making my skin more plump and firm. Azure Naturals recommends to start using Retinol in your late twenties or thirties to combat fine lines before they become apparent. This is perfect for me to start using now and I agree with their recommendation. It's better to keep your skin plump and hydrated to avoid wrinkles before they begin than it is to treat wrinkles once they are visible. 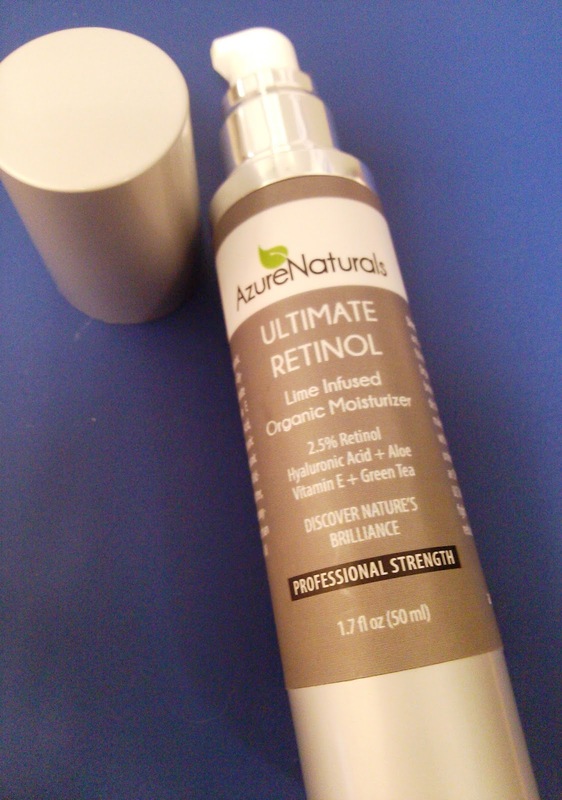 Overall, the Ultimate Retinol Moisturizer is gentle, effective, and works for me.